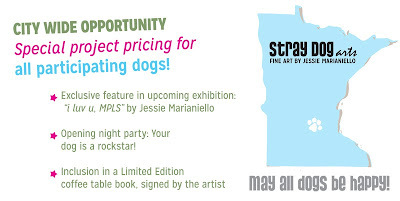 Stray Dog Arts: Calling all Minneapolis dogs! :: i luv u, MPLS! :: A special project opportunity!! 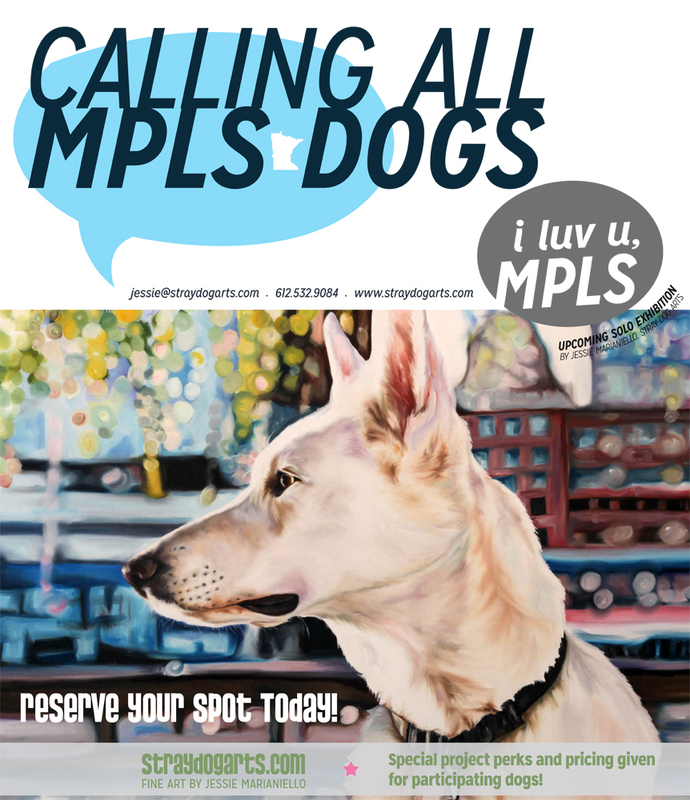 Calling all Minneapolis dogs! :: i luv u, MPLS! :: A special project opportunity!! Welcome to my gratitude project! As an artist, I love the way both art and dogs bring people together, creating a common ground between those who might otherwise remain strangers. Incredibly, I'm lucky enough to experience a life that includes both art AND dogs! Once upon a time, I didn't believe it was possible to fully support myself as an artist. But then something happened: Minneapolis proved me wrong!! For the past six years, I've been living my dream and loving what I do. And now? It's time to have a show in celebration of YOU! In the past 6 years I have done several major solo exhibitions including the Dogs of Bryn Mawr, Dogs of Linden Hills, Dogs of Edina, Animals of AHS, and BULLDOG (just to name a few). i luv u, MPLS! is gearing up to be the biggest exhibition to date! Each show takes on a tremendous life of its own and something tells me that this one is going to be no exception! I am offering my old prices to anyone who commits to being a part of this exhibition. Due to an increasingly extended wait list, my prices have recently doubled. 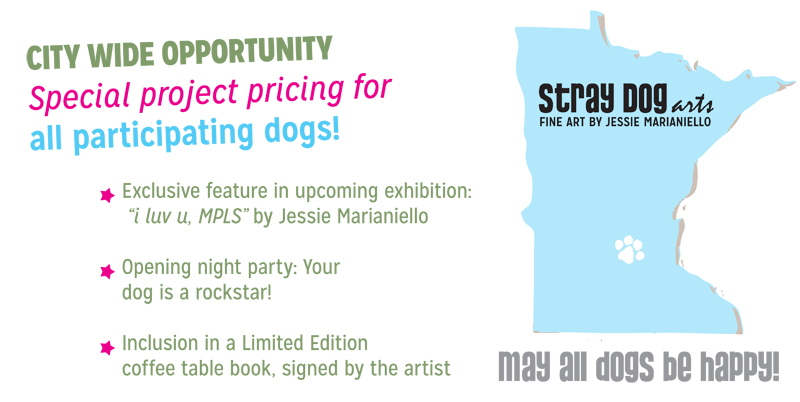 However, I want to extend my old pricing to Minneapolis area residents who become a part of this project as my way of saying THANK YOU to the community of dog lovers and art enthusiasts who have helped me to succeed in doing what I love most. Prices start at $1,800. This includes a private professional-grade photoshoot with your dog(s), consultations and, of course, an original work of art of YOUR dog(s)! Not to mention, you get to jump the wait list for commissioned portraits! Please contact me for a full price list (mention this project for old pricing). Multiple dog homes are also invited! An approximate 50% nonrefundable deposit is required to get the process started and hold your place in the show. The remaining amount is not due until the portrait is completed. Check, credit cards and Paypal are all accepted. Feel more comfortable spreading out the investment over time? Monthly payment plans via credit card are also an option. Please do not hesitate to ask for more details, if interested! I like to do a photoshoot as early in the process as possible. My photoshoot schedule books out quickly and so let's go ahead and get something planned! :) The photoshoot takes about an hour and is totally casual and fun. We can do this at your home or on location in the Minneapolis area. The second half of the project will be dedicated to painting these gorgeous portraits into being! I work in oil on extra deep gallery wrapped canvas. This gives your painting a clean, contemporary look and so no framing is necessary. Last but not least, once the paintings are completed, it will then be time to CELEBRATE!!!! In approximately 18 months we will celebrate an OPENING RECEPTION! You, YOUR DOG, your friends, family and the public are all invited! This is the BIG NIGHT when everyone's paintings are unveiled for the first time and, OH(! ), what a night it will be!!!! The energy is ELECTRIC! Live music, hors d'oeuvres, wine, good company--an unforgettable dog-friendly Fine Art experience! Exact date and location is TBD by the size and scope of the exhibition. May all dogs be happy! The i luv u, MPLS! gratitude project proudly supports Red Lake Rosie's Rescue. RLRR, a non-profit, all-volunteer organization is near and dear to the heart of Stray Dog Arts. Therefore, a portion of all profits will be donated to the work they do! Also keep an eye out for upcoming fundraising opportunities! Thank you, Minneapolis, for so graciously helping these animals in need!